Johnson’s arrival here during the afternoon was awaited by several hundred people, who gave the champion a cheer as he alighted from a special car. Half a dozen automobiles were lined up to receive the party. With kids dangling off the side and backs [sic] swarming every available portion of the cars, the joy parade began. Several of the centrally located cafes were visited, and the big fellow bought more often than it was his turn. The local colored folks tendered Johnson a banquet in a restaurant over Donovan’s café, in Fairfield Avenue. Then he went to Jackson’s theatre. The streets were thronged with people but most of them cared only to see the big fellow in street attire, for of the hundreds who flocked about the places the champion visited, a very small percentage bought tickets to witness his exhibition. Johnson was larger than life and his victory an antidote to the humiliations of everyday life and the steady drumbeat of Southern lynching reports in the newspapers of the day. 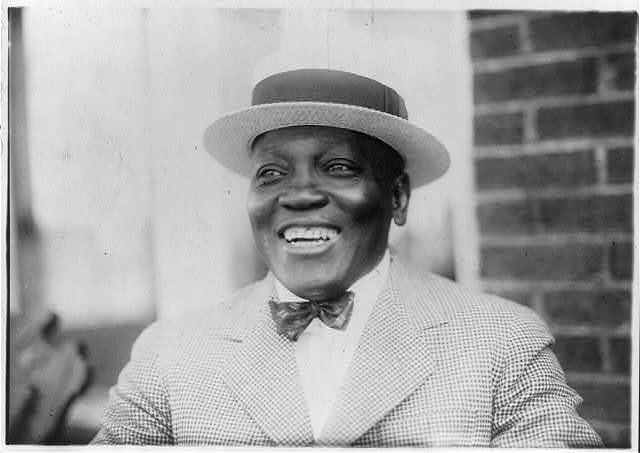 His iconic status was certainly reinforced in the few weeks preceding his visit to Bridgeport, as Connecticut newspapers were freely debating whether or not town governments should allow local theaters to show the film of the Johnson-Jeffries bout. The filmmakers who made a movie of the Johnson-Jeffries match expected the “Great White Hope” to win and the reception across the nation to be wildly enthusiastic. Instead, within twenty-four hours of the fight, a group called the United Society of Christian Endeavor sent out a mass appeal to state governors to ban showings. “Will you join other governors in recommending prohibition of these demoralizing shows? Save our young people.” (Ward, p. 230). The USCE claimed that their campaign prevented 25,000,000 people from seeing what they viewed as a degrading spectacle (Bridgeport Evening Farmer, July 11, 1910) and Connecticut governor Frank B. Weeks was won to their point of view (Bridgeport Evening Farmer, July 7, 1910). Many Connecticut mayors, in the end, decided that they really had no power to ban films, but the USCE campaign forced the film companies to self-censor and restrict distribution to “stage” theaters. The legal history of what has been called “one of the worst waves of movie censorship in American history” is still of interest to scholars (Orbach, p. 270). Much detail about the way this debate played out in Connecticut can be found in the newspapers being digitized by the Connecticut Digital Newspaper Project, a project funded by a National Endowment for the Humanities grant. The Bridgeport Evening Farmer, the Bridgeport Times, and the Norwich Bulletin runs that fall between 1910 and 1922 will eventually be searchable via the Library of Congress Chronicling America website. Orbach, Barak Y. “The Johnson-Jeffries Fight and the Censorship of Black Supremacy,” Arizona Legal Studies Discussion Paper No. 10-09, April 1910. http://papers.ssrn.com/sol3/papers.cfm?abstract_id=1563863. “Topics in ‘Chronicling America’—Jack Johnson vs. James J. Jeffries.” http://www.loc.gov/rr/news/topics/bigfight.html. “Unforgivable Blackness,” A Film Directed by Ken Burns. http://www.pbs.org/unforgivableblackness/. Ward, Geoffrey C. Ward. Unforgivable Blackness: The Rise and Fall of Jack Johnson. New York: Alfred A. Knopf, 2004. State Library Catalog.